As a boy and young teen, I always knew I'd be a writer. Back then my interests were mostly fantasy and science fiction. Then one day my mom received in the mail a box of books. She had joined some book of the month club. As I was an avid reader, I perused the books to see what was there. Most of them were cook books, which made sense since these were for my mom, but one of them was a book titled "Pet Sematary" by Stephen King with an image of a howling cat on the cover. This was 1983, and I was 12 or 13 depending upon the actual time of year. Of course I had heard of Stephen King at that point. Who hadn't? He was the hottest author in the world at the time. But horror had never been my thing. So, I stacked my moms books together and left them sitting on a table. Over the next several days, that howling cat image kept calling back to me. I would pass that stack of books and glance at the outer edge of "Pet Sematary," but then I would go on my way. After a couple of weeks of this, I couldn't stand it any more. I snagged up "Pet Sematary" and started reading. "Pet Sematary" was not only the first Stephen King book I ever read, but it was the first horror novel I ever read. I'd read a few Poe short stories in school at the time, but I'd yet to immerse myself into a deep horror tale. "Pet Sematary" had me hooked. It wasn't just that it was horror or that there were supernatural elements, though that helped, but it was the way King told his tale. This wasn't a story taking place in some ancient faraway kingdom or a billion light years away in outer space; this was a tale that could have happened down the street from me. And I think that's part of what grabbed me and has stuff with me over the years. For me, King wasn't just writing horror, but he was taking fantasy elements and infusing them into the real world, and those elements would be scary as hell in the real world. Imagine if a real-life dragon showed up and started spewing flames. We'd all go nuts, and it would be terrible. This was how I was seeing things. There was also the factor that King knew how to build suspense quite well. For the next decade, I wanted to write just like Stephen King, or at least to tell the kind of stories he told. I tried, and even did passably well if I do say so myself, but eventually as a writer my own style and personal interests began to work into my bloodstream and out through the keyboard and on the paper. I still occasionally pen a tale of horror that is somewhat Kingesque, but I feel I've mostly gone on and grown as a writer into other interests. King does what he does very well, but I'm not King. I have my own things to say. This is an ongoing series looking at books that have influenced me as a writer. I was a huge James Bond fan when I was a kid, and still am somewhat a fan to this day. Sean Connery has always been my favorite Bond, but "Live and Let Die" is my favorite Bond movie. As a kid and young teen, I delved into some of Ian Fleming's Bond books. They were good. They were interesting. But they didn't quite have enough action for me, the budding young man. I wanted a lot more of things blowing up, and of bad guys getting shot. Then, at about age 12, I discovered The Executioner series of men's action/adventure novels. A couple of times a year a new book in the series would come out. The plot was simple: A Vietnam veteran named Mack Bolan lost his family to the mafia, so now he was out for revenge. Each book detailed Mack's latest adventures in taking down the mob. It was great, explosive stuff. I first picked up the series with this book, "Satan's Sabbath ," which was actually a shame. It was the end of the original author's run on the series. Don Pendleton would no longer write Mack Bolan books after this one. Also, the series was going in a new direction with Bolan taking on terrorists. There was really nothing wrong with the new direction, but Pendleton had been the one to hook me on the series and I wanted to read his take on his character before going on to other authors. Well, the good thing about starting with book 38 was there were 37 books before that one, all but one (#16) written by Pendleton himself. So, I spent the next year searching for and reading as many of Don Pendleton's The Executioner novels as I could find. I never read all of them, but I did read a good number. And once I finished with Pendleton's original run, there were still new Bolan adventures coming out, only this time a new novel came out at a least once a month. I don't regularly read The Executioner novels nowadays, though I pick one up from time to time, and the series is now up in the four or five hundreds or something ungodly like that. It's almost like a comic book in that way. 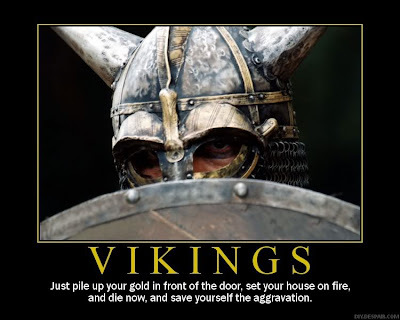 As a writer, The Executioner novels taught me a lot. They weren't always the best reading, depending on who was doing the actual writing, but they were almost always taught with action. Frankly, I learned how to write action scenes from these books, and I suggest any writer wanting to learn to write decent action scenes couldn't do much better than reading through a dozen or so of these novels. Plus they can be a lot of fun to read. This is part of an ongoing series looking at books that have influenced me as a writer. In 1978, I turned 9 years old. By that point, the future fantasy author had rolled through Tolkien and had discovered Terry Brooks. In my own 9-year-old way, I thought I knew everything there was to know about fantasy fiction. That same year I discovered a sub-genre of fantasy known as Sword and Sorcery. Big guys with muscles swinging swords. Evil wizards. Damsels barely clad in chain string bikinis. Murky monsters. You know. Fun stuff. And how exactly did I discover Sword and Sorcery? Through a collection of short stories titled "Thieves' World." The stories in Thieves' World take place in the crumbling, cesspool of a city known as Sanctuary, one of the outer cities of the Rankan Empire. Within Sanctuary can be found mages, thieves, assassins and generally all kinds of shady characters. Every once in a while even a demon or something resembling a zombie will show up. It's the kind of place you don't want to visit after dark. Or even during daylight in certain parts of town. The collection was filled with fantastic tales by such authors as Poul Anderson, C.J. Cherryh, Marion Zimmer Bradley and my personal favorite, Andrew J. Offutt. Offutt wrote about a character named Hanse Shadowspawn, a thief who dressed all in black and carried a dozen or more daggers hidden on his body. Despite his dark demeanor, Hanse was actually a pretty good guy and likable. Thieves' World proved to be popular enough to continue in a series, of which there were originally 12 books and probably another dozen or so independent novels. In the early 2000s, the series was started up again with three new books, but the last one was printed in 2004 and there have yet to be signs of any further material. As a writer, I learned a lot from the original Thieves' World book. It opened up new potentials to me, dark potentials. Before, all that fantasy I had read had been quest oriented with big, saving-the-world kind of stories. Thieves' World showed me another way. It showed me little stories, but stories still containing excitement, stories of things that could happen just around the corner, deadly and mysterious things. Also, Thieves' World lead me to Andrew J. Offutt, who wrote several novels in the 1970s containing characters of Robert E. Howard, characters such as Conan the Cimmerian and Bran Mak Morn. Thus, Thieves' World lead me to Offutt, Offutt lead me to Conan, and Conan lead me straight to Robert E. Howard, the father of Sword and Sorcery itself. My writing and reading has never been the same since. Notes: I received this collection of Sword and Sorcery tales in the mail today, and it couldn't have come at a better time. I've been slogging through War and Peace for months now, with a few forays into other literature from time to time, and it was time for a break. I needed some good, strong action reading, and this collection from Rogue Blades Entertainment is sure to excite. How do I know this? Well, first of all, I'm familiar with this publisher and know what to expect. Second of all, my story "Kron Darkbow" appears in this anthology, so I know it's got to be good. Also, one of the nice pleasures about a book like this is I can read a few stories then go back to War and Peace for a while, then get back to this anthology, then back to War and Peace and so on. It'll be a nice breath of fresh air from time to time when I'm feeling a bit overwhelmed with the literary masterpiece (and it is) of War and Peace. Mini review: Some fine reading here. I was glad for the break from War and Peace, but now I'll get back to it. 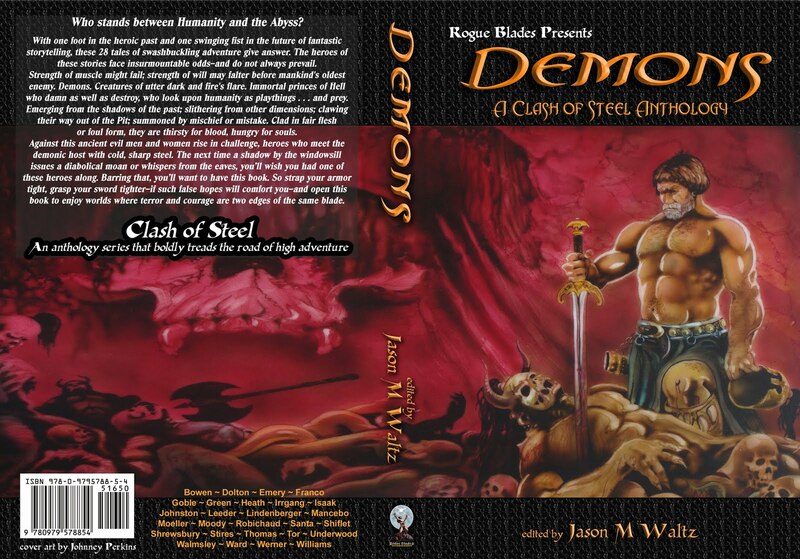 Find a longer review on Demons: A Clash of Steel Anthology right here. This is the fifth part in an ongoing series looking at the books that have influence me as an author. Like many young readers in the 1970s, The Hobbit was my introduction to fantasy literature. And growing up in small towns where finding books was no easy task, it was quite difficult to get my little hands on a fantasy novel. But after discovering The Hobbit, I was hooked. And I had to have more. The next logical course was to follow up The Hobbit with more works by J.R.R. Tolkien. Again, this was the 1970s. This was back in the day before Tolkien's son Christopher had come along an reworked a bunch of his father's material and published it. Heck, even Tolkien's The Silmarillion was just coming out in book stores. The Lord of the Rings was the only choice. Not that that was a problem. The Hobbit was considered children's literature, but The Lord of the Rings was the adult stuff. And adult stuff was risque and exciting. At least that's how I saw it as a kid back then. So I spent a summer reading The Lord of the Rings. I suppose, looking back on it, the first book in this trilogy, The Fellowship of the Ring, was what I considered my first adult fantasy reading. Again, as with The Hobbit, I was hooked. But even more so. The plot was more dangerous. The characters were more indepth. The writing was more ... uh, Tolkieny. It was great adult reading for me, reading about this group of hobbits who were one this great big mission to save the entire world. What could be of more importance? The Fellowship of the Ring has always been my favorite of all Tolkien's work. It's also my favorite of the Peter Jackson movies based upon The Lord of the Rings. I seem to be in the minority here. Many readers of Tolkien with whom I've been in contact tend to enjoy the third book, The Return of the King, as their favorite. My experience has also been the same with the movies. Admittedly The Return of the King is where everything is wrapped up, but I've always felt the character development in The Fellowship of the Ring was top notch. And it was the characters, the good and the evil, who made me fall in love with Middle Earth. Market saturation has given trend recently to an anti-Tolkien feeling among some fantasy fans and writers. To some extent this can be expected. What's popular often becomes passe. It's also true that today's reading and viewing audiences have different expectations than those of Tolkien's day, from roughly the 1930s through the 1950s. But no one can deny the influence Tolkien and The Lord of the Rings has had on fantasy fiction in particular and mainstream fiction in general. If you like hard-hitting horror, and you happen to own a Kindle, look no further than Deadman's Tome: Best of the Demonic. For only 99 cents you get 10 tales of horror from Jesse Dedman, editor and publisher of the online ezine Deadman's Tome. And yes, I have a story inside. My tale "Everyone is Zombies" is the final story in Deadman's Tome: Best of the Demonic. And for the inquisitive, the tales featured in this publication aren't specifically about demons or the demonic. Deadman's Tome used to be titled Demonic Tome, and this publication highlights some of the tales under the older title of the ezine. This is the fourth part in an ongoing series looking at books that have influenced me as a writer. A lot of avid readers started reading as a kid, and many of them often have a favorite book or series from their childhood. Mine was The Three Investigators series. In this series of books, three boys in their early teens went about solving mysteries. In most of the novels there were supernatural elements, elements that eventually were explained away. This should sound familiar to you Scooby Doo fans, because the plots were somewhat similar but without the crazy antics of the likes of Scooby and Shaggy. A lot of young readers back in the day went for the Nancy Drew or Hardy Boys mysteries, but those never did much for me. I always preferred The Three Investigators. What initially drew me to The Three Investigators series was this book, specifically the cover. I can remember in fourth grade going to my school library and randomly pulling this book, The Mystery of the Sinister Scarecrow, off the shelves. The artwork by Robert Adragna blew me away. I had to read that book. And I did. Followed up by 20 or so of the other books in the series, all with fantastic artwork and great stories that kept me interested throughout. One strong element about The Three Investigators books that has stuck with me was the notion that the characters had to solve their own problems. As the three main characters in this series were only 13 or so years old, they had a lot of limitations compared to an adult. They couldn't drive. Adults had a tendency not to believe them. Things like that. But the characters always persevered, despite the many setbacks and dangers they faced in each novel. As a young reader, I picked up on this, and I believe it affects my writing even to this day. It taught me to never let the characters off easy, to have them solve their own problems; anything else strikes of deus ex machina and can seem silly to the reader. That being said, eventually I grew older and moved on to other reading material, but still today I have a fondness for this series. I've not mentioned lately what I've been working on, so I thought now was as good a place as any. Mostly I've been trying to do a lot of promotion for my Kobalos epic fantasy trilogy, specifically my e-book City of Rogues. Mostly it's working, as my sales are better this month than ever so far. But I've been writing. A week or so ago I finished the first draft of a horror short story, tentatively titled "Born to Bring Trouble." I'm setting that story aside for a month or two to let it gel, then I'll get to editing it. The biggest project I'm currently working on is my novella, Bayne's Climb, and I believe I'm a little more than halfway finished with it. It should be about 45,000 words once completed. I started Bayne's Climb earlier this year but set it aside because I got busy with real life stuff, but recently I picked it up again and I'm enjoying it quite a bit. Bayne's Climb is my attempt to mix Sword and Sorcery with a sort of literary style and plot. I kind of got the idea from reading some of the works of Jack Vance. Will the novella work? I don't know. I'm enjoying it, but only time will tell if readers wills. This is the third part of an ongoing series looking at books that have influenced me as a writer. Written by Anna Sewell and originally published in 1877, Black Beauty has come to be considered literature for young people even though it was not meant to be such. But it is understandable to see how this came about after having read the book. The story is that of Black Beauty, a horse living in 19th Century Britain, and the tale is told in first person by this horse. The chapters deal with Black Beauty's various owners, some cruel and some not, and much of the story's focus is upon cruelty towards animals and how it affects the animals. There's not much fantastical here, strictly speaking, unless one considers a horse being able to tell his own story fantastical. But it is a heartwarming tale. Also, personally, this is an important book for me. It was the very first book I ever read. I picked it up at my school library in second or third grade, and I was soon hooked. I then went on to read a sequel, The Son of Black Beauty by Phyllis Brigs, and a string of unrelated novels in the Black Stallion series written by Walter Farley. While Black Beauty was my first book, it was by no means my first reading material. Like many other kids growing up in the 1970s, I'd read and had read to me plenty of children's literature, such as the Dr. Suess books. Also, I was a huge comic book fan; I poured through tons and tons of comic books, my favorites back then being the Fantastic Four, Captain America, Batman, Superman and World's Finest (with Batman and Superman). Why did I pick up Black Beauty in the first place? I honestly don't know. I wish I could remember, and it kind of bugs me that I can't. I grew up in horse country, and though I like horses I've never been particularly drawn to them, so I don't think it was the specific subject matter. However, I would like to think this book influenced my beliefs and opinions about animal welfare. This is the second part of an ongoing series looking at books that have influenced me as a writer. When I was a kid in the 1970s, fantasy fiction wasn't easy to find in the towns where I lived. Of course I was able to get my hands on The Hobbit and The Lord of the Rings, but nothing beyond that was available. Which was a shame, because after reading Tolkien (and seeing the first Star Wars movie) I yearned for more fantasy. Along comes author Terry Brooks. And the gates of the heavens opened and the faithful were allowed entrance! I actually started my Shannara reading with the second book in the series, The Elfstones of Shannara. I'd stumbled across a big paperback version of that novel at a local book store and I had to snag it up. But soon after that same book store got in a paperback copy of The Sword of Shannara, and I was swept away in fantasyland. Over the years I've read not quite a half dozen of this author's books, and admittedly I've never been blown away by them, but in all fairness I've read worse and seen worse out there on the market. But Brooks helped me through the latter parts of my childhood and early teens, giving me exciting fiction to read when there was a dearth of it available to me. Brooks even helped me through a couple of tough spells when my mom was in the hospital in the very early 1980s, and I had to spend days upon days in waiting rooms with nothing to do but read. So I've always had somewhat of a soft spot for Brooks, especially his world of Shannara. Over the years, Brooks has often caught grief from some fantasy fans who have accused him of being a Tolkien ripoff. Those fans' opinions are not completely unjustified because Brooks' early Shannara works have a lot in common with The Lord of the Rings, things like elves, dwarves, swords, quests, druids that seemed an awful lot like wizards, etc. But for a kid dying to get a fantasy fix and finding little else available, Brooks was awesome. I can't say Brooks has had a direct influence upon my own writing style, but his subject matter was definitely fuel that kept my own fantasy fires burnings. Also, I love one of Brooks' nonfiction books on writing, "Sometimes the Magic Works," mainly because the way he approaches writing fiction seems quite similar to my own, an immersion into the writing that at times seems to take one away from or out of the real world, almost in a spooky kind of way at times. If nothing else, the Shannara books kept me reading and kept me interested in fantasy fiction. But I'd like to think there was a little more than even just that to the whole thing. I'd like to think Terry Brooks helped me along my road to become a fiction author. Anyone who knows me or who has read this blog for a while knows I'm a nutcase for lists. I like to make lists of things to do, things I like, things I need to remember, etc. I guess it fills some kind of basic emotional need for me, a way of bringing order to the chaos. So I'm starting another list. This is the first post in a series of 100 in which I will be looking back at numerous books, mostly fiction, which have had a big influence upon myself as a fiction writer. As the title suggests, most of these books will be works of fantasy, though not all. Also, I will attempt to put up a new post daily, but the reality is that that's likely to become cumbersome, to I'll just try to put up a new post whenever possible with a goal of being finished with this list by the end of the year. These posts are not meant to be overly literary, critical or academic, but more of a down-to-earth look at when, how and why these particular works affected my own writing. I'm starting with one of the most obvious fantasy novels, The Hobbit by J.R.R. Tolkien. Originally published in 1937, The Hobbit has probably had more influence, directly or indirectly, over the last century's fantasy fiction than any other single book. Some might argue that Tolkien's Lord of the Rings has had more influence, but without The Hobbit there likely would never have been a Lord of the Rings. Also, even fantasy authors who are not fans of Tolkien (Michael Moorcock comes to mind), likely would have to admit Tolkien and his hobbits have been hugely important and influential upon modern fantasy fiction. Growing up as a kid in small towns back in the 1970s, there wasn't a lot of fantasy fiction to be found in the local book stores. Even the libraries didn't have much to offer. Fortunately, at least Tolkien's The Hobbit and his Lord of the Rings were relatively easy to find. That was it for me. No Conan stories. No endless epic fantasies. Nothing. Nada. 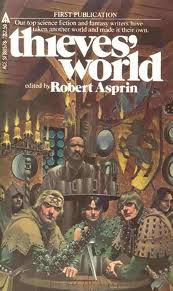 At least not until the late 1970s when Terry Brooks came along and one of my local book stores began carrying the Thieves' World series of anthologies edited by Robert Aspirin. But Tolkien was it. The only fantasy fiction I had available to me. I'd started reading with comic books, then moved on to longer works appropriate for kids, such as the Black Beauty and Black Stallion novels and the collection of Alfred Hitchcock Three Investigators series, but eventually I discovered Tolkien. Growing up in a small town, there weren't a lot of kids who were readers. Most were into sports of one sort or another. I liked sports, at least some of them, but reading was my big thing. Among the few reading kids I did know (you remember them if you're old enough, the nerdy kids with thick glasses and haircuts that had been made with a bowl), Tolkien was the lone author everyone said I had to try. So, I did. I decided to start with The Hobbit for two reasons. One, it was a stand-alone story, so if I didn't like it I didn't have to worry about not finishing a longer series. Two, everyone was telling me The Hobbit was basically a prologue to the Lord of the Rings and I wouldn't understand what was going on with Sam and Frodo unless I knew about what had happened with Bilbo. Of course I read The Hobbit and loved it. I've read it several times since. Nowadays, being older and more widely read, I'm a little more critical of The Hobbit and Tolkien in general. Don't get me wrong. I still love Tolkien's writing, but it doesn't call out to me the way it did when I was a child. I could go on. But The Hobbit, for me, brought much of the vitality and adventure of comic books to life on a broader, grander scale than any comic book (at the time, anyway) could ever have dreamed of accomplishing. Tolkien's prose went beyond comics in that his words allowed my mind to create its own images of each character and of events. It was like having my own personal movie in my head, but better because my mind could include senses beyond that of the mere visual. So, that's what I have to thank Tolkien's The Hobbit for, for freeing my mind, for allowing me to dream of possibilities. 'Nuff said. At least for now. As a fiction writer in the U.S., like most of my ilk, I mostly sell my short stories to U.S. publications. Every once in a while I will take a look around at foreign markets, and I've been fortunate enough to have a couple of stories placed in English or Scottish markets. But I've always been intrigued by foreign markets, especially non-English markets. Why? I don't know. A sense of the alien, perhaps? I do know I've often enjoyed reading fiction from non-English writers because I find different perspectives, different ways of looking at situations and the world. Still, I've never tried to sell any fiction to non-English markets because ... well, I can only write English, though I can read Spanish and most latin-based languages to a far lesser extent. It has recently come to my attention, however, that there are a number of foreign markets that are willing to translate English stories into their audience's language or have enough of an English-reading audience that they publish at least some English-written stories. Because writer Douglas Smith has a Foreign Market List. That's right. If you are a writer of fantasy and science fiction, and possibly of horror, this list can open up new possibilities for you. There's much of interest here, and you might even find a place to that will publish or re-publish one of your tales. Keep in mind, even if you've sold a story to a U.S. market, quite often you still retain the rights to sell the story to a foreign market; that's not always true, so make sure to check your contracts before venturing forth. Or you might have an older story in which the rights have returned to you. Foreign markets offer another possibility for writers to get their name out there, so check it out. I'm not going to tell you. That's right, I'm not going to tell you what is Sword and Sorcery. Instead, I'll let those who know what they're talking about tell you. And who would that be? Oh, no other than the many authors who have stories in the new anthology, Swords & Dark Magic: The New Sword and Sorcery . A recent post over at SF Signal ask this anthology's authors "How do you define the sub-genre of Swords & Sorcery?" So check out the interesting and fantastic answers, the first of which comes from no other than Michael Moorcock himself. For a limited time, my e-novel "Dark King of the North" is available at Smashwords for free with a coupon code. The code is good until July 29, 2010. How do you get this code? E-mail me and I'll e-mail it back at ya. Why am I doing this? Because I'm a swell guy. Actually, the truth is there are some technical problems going on with "Dark King of the North" over at Amazon. Some Kindle readers are wanting the third book in my Kobalos trilogy, but since they can't currently get it at Amazon, I thought I'd give them another option. And with the coupon they don't even have to pay for the book. In case you're a Kindle owner and have concerns about using Smashwords, I've confirmed with Smashwords that the .mobi version of "Dark King of the North" can be uploaded onto a Kindle and read. Or you can read the e-book directly on a computer or by downloading it to your computer. The options are yours. Hopefully the issues with this book will soon be taken care of at Amazon. My apologies to all readers who wanted "Dark King of the North" but did not find it available. And yes, there were plenty of other books that could have made this list. But they didn't. I wanted to cut it off at a hundred before it become unwieldly. But go ahead and make your own list, or offer suggestions for books you'd put on your list. What I'm coming to realize is none of that makes any difference anymore. Each writer sets his or her own goals as a writer, and if one's goal is to be published by one of the big shots in NY then that's what they should shoot for. The rest of us can be satisfied simply making a living writing. And just to clear up: I have nothing against the big NY publishers. Yes, I'd work with them in a heartbeat. I'd take the money and run. But I do get sick and tired of those within the industry who cannot adapt to the changing business and technology, and instead of doing something about it they go on the attack. I'm a former newspaper journalist. I've already been through this once before. Not this time. Demons is alive! ALIVE I tell you! For those of you who love Sword & Sorcery and action-oriented fantasy, there's a new collection of stories from Rogue Blades Entertainment. 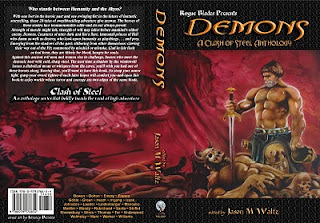 I present to you Demons: A Clash of Steel Anthology. Inside this collection you will find 28 tales of fantasy adventure with a focus upon the demonic in one form or another. You'll find some fine writing here by the likes of Steve Goble, Rob Mancebo, Bill Ward and many others. And guess what? You'll find one of my own stories there as well. Yes, my tale "Kron Darkbow" is among the many other fine tales. So get to buying and get to reading! Last year when I first began uploading e-books up to Amazon for sale on the Kindle, I had no clue as what kind of prices to place on my e-books. As I would be an unknown author for nearly everyone who might purchase my e-books, my thinking was that I should go as cheap as possible. I fudged around with some pricing for a while, but eventually I settled on a price of about a dollar. Now my e-books are beginning to sell somewhat. No, I'm not rich, but the sales are mounting and I'm bringing home enough money to help pay the bills. The funny thing is I keep running across comments online from people who have read my first fantasy novel, City of Rogues, or I keep getting e-mails from first-time readers who say the same thing: They almost skipped reading my e-books because they believed the cheap price meant the books weren't any good, but they were happy they took a chance on my material. This is flattering, of course. But there's also a part of me that has to wonder how many readers were turned off from my e-books because of the low prices. Right now Amazon is running a sale on my e-books (as well as those of other writers), and most of my available e-books are going for the low, low price of 79 cents. I'm glad the readers are getting a deal while I still make the same amount of money from sales. But if the cheap price is a turn-off for some readers, should I consider raising my prices? I have several short story collections and a couple of screenplays available for the Kindle, and those I'll keep at about a dollar. Those were short projects and don't offer potential readers the depth and reading experience of a novel. But I have to wonder if I should raise the prices of my novels? Another issue is earnings. Amazon now pays a higher percentage of earnings to authors who charge at least $2.99 for their e-books. So, since I'm not charging that rate, my percentage of earnings for each book is lower. So, should I raise my prices? Maybe to $2.99 per novel? Or maybe keep the cheap rate for the first novel in my fantasy trilogy, but $2.99 for the second and third books? I'd really like to hear others' opinions, so don't be afraid to speak up, especially if you've read any of my e-books or even my other writings. Not all writing is created equal. Some writers are good. Some are not. What makes a good writer, and good writing, is somewhat debatable, but most of us have our opinions on it. Especially if you happen to be a writer. Too often, however, writers and even readers do ourselves a disservice by being snobbish about what we read. Some of us only read romance novels, or fantasy fiction or newspapers. Some of us stick to literary magazines or military publications or housekeeping books. While there's nothing wrong with having a favorite type of literature, we miss out on a lot when we don't allow ourselves to branch out and step outside our safety net. Believe it or not there is good writing out there, even enjoyable and entertaining writing, beyond the scope of what most of us stick with. As a personal example, one of the best non-fiction books I've read is "Education of a Wandering Man" by Louis L'Amour. L'Amour is generally known for his fictional Western novels, a genre I rarely read. If I had not taken a chance on his non-fiction writing, even though I'm not the biggest fan of Western novels, I would not have discovered the delights of "Education of a Wandering Man," basically the tale of L'Amour young days before he became a writer. In the book he writes about various misadventures, including walking out of Death Valley on foot. Stretching, and sometimes even tearing down or jumping over, our boundaries is even more important for writers than for readers. Readers generally read to educate themselves or for entertainment purposes, while writers read not only for those reasons but also to study writing. To study writing properly, to learn new ways of using language for writing, we as writers should be as well read as feasibly possible. Reading widely will actually improve our writing. Another example is "In Cold Blood" by Truman Capote. "In Cold Blood" is a non-fiction true crime book about the murder of a Kansas family back in the 1950s and the trial and executions of the family's killers. While unnerving, these actual events sound fairly tame to many of the true crime book published today, most of which involve serial killers and all kids of downright freaky and awful murderers. Still, by far, "In Cold Blood" is the best of the many true crime books I've ever read. Capote doesn't present the story in the typical, news-like narrative form common to many true crime books, but he uses a narrative that reads like the best of fiction writing. "In Cold Blood" is written so well it can tear your emotions apart, on one page having you appalled at the murders while on another page having you feel sorry for the actual murderers. Fiction writers need to read this book to witness a story told at its finest. Also, for fiction writers, reading non-fiction can give one all kinds of story ideas. Today's science magazines can offer information that's far beyond anything science fiction novelists could have dreamed up even a couple of decades ago. For non-fiction writers, study the art of fiction can help to improve one's craft. Fiction writers tend to use stronger verbs and adjectives than their non-fiction counterparts, thus non-fiction writers can learn a thing or two here, as well as possibly picking up some plotting ideas. Because believe it or not, even non-fiction can be plotted out, and well. So spread your writing and reading wings and try something new. Not only could you possibly pick up some hints and tips for your craft, but you might even enjoy reading something different. And discovering something new is always one of the finest moments of being a reader or writer. Last month, June, I had the most e-book sales I've ever had on the Amazon Kiindle. So far, in the first week of July, I've already topped last month. That's right, my first week of sales is better than my entire last month's sales, and that was the best month I've ever had! So buy those e-books! Poppa needs a new pair o' shoes! If you like writing and reading dark fantasy tales of assassins on the prowl, there's some good news. The publisher Rogue Blades Entertainment is now accepting submissions for the "Assassins: A Clash of Steel Anthology." I've had the pleasure of being published by this company before, and I've always enjoyed working with publisher/editor Jason M. Waltz. So if you think you've got what it takes, check out the submission guidelines and get to writing. And if you're not a writer? Check out Rogue Blades Entertainment anyway. They provide plenty of action-oriented fantasy tales to read. You find something you'll enjoy! "He suffered from an unlucky faculty ... the faculty of seeing and believing in the possibility of good and truth, and at the same time seeing too clearly the evil and falsity of life to be capable of taking serious part in it. Every sphere of activity was in his eyes connected with evil and deception. Whatever he tried to be, whatever he took up, evil and falsity drove him back again and cut him off from every field of energy. And meanwhile he had to live, he had to be occupied. It was too awful to lie under the burden of those insoluble problems of life, and he abandoned himself to the first distraction that offered, simply to forget them." "Sometimes Pierre remembered what he had been told of soldiers under fire in ambuscade when they have nothing to do, how they try hard to find occupation so as to bear their danger more easily. And Pierre pictured all men as such soldiers trying to find a refuge from life: some in ambition, some in cards, some in framing laws, some in women, some in playthings, some in horses, some in politics, some in sport, some in wine, some in the government service."